Can they continue to turn up the heat? Food stocks have been on fire. Whether that’s been fast food stocks, fast casual stocks or whatever variation in between. The economy is going strong, the labor market is tight and that means good things for disposable income. As a result, a number of consumer-oriented food companies are doing quite well right now. Are they about to fizzle out or is the run just getting started? That varies by company, but with only tepid inflation impacting costs and bringing in technology to improve supply chain operations and efficiencies, many companies continue to churn out impressive results. Whether that’s on the comparable-store sale side or the bottom line (or both). Let’s quit wasting space and get on with the list of fast food stocks that have been on fire! No matter what the bearish thesis is, it doesn’t matter. 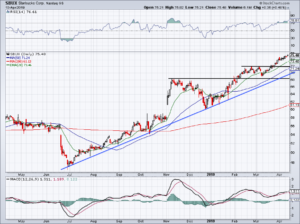 Some shoot against Chipotle on a fundamental and valuation basis. 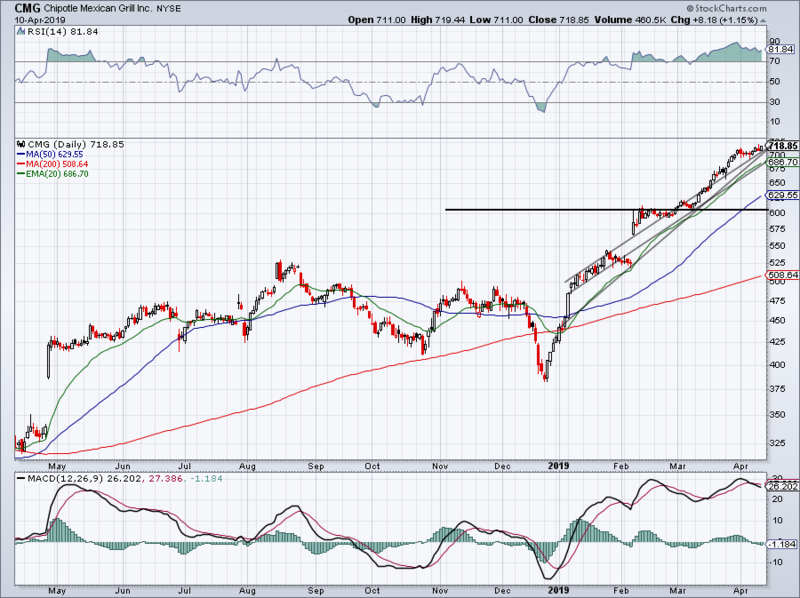 Others note how overbought the stock has become. But none of these facts matter because the market can act irrational for far longer than expected. That’s why discipline is so important and the only real factor to remember is price. Look, I get it. Chipotle reported earnings on February 6th, beating on earnings and revenue expectations. However, do earnings of just $1.72 per share and revenue growth of 10.4% justify an overbought condition for two months and a $194 (37%) rally in the stock? No, but that’s what momentum can do to a stock. So what now? Obviously the risk/reward here does not favor those initiating a new long position. However, it’s clear that — short of a food-borne illness breakout — Chipotle is back in investors’ good graces. 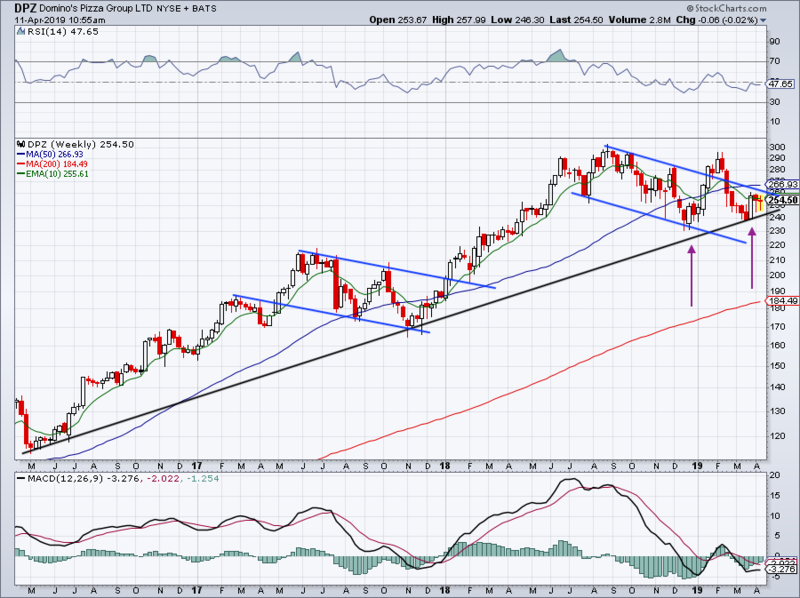 Eventually CMG stock will tire and it’s a question of how much this one will pullback, not if it will do so. So far, it’s been following its trends pretty well and luckily, it’s a name we’ve liked since January. A pullback into the 50-day will likely attract some buyers and while I’m not sure if we get a $120 decline down to $600, but that could be a solid level of support too. Near $606 is the 38.2% retracement for the 2019 range. Watch for this one on a pullback. 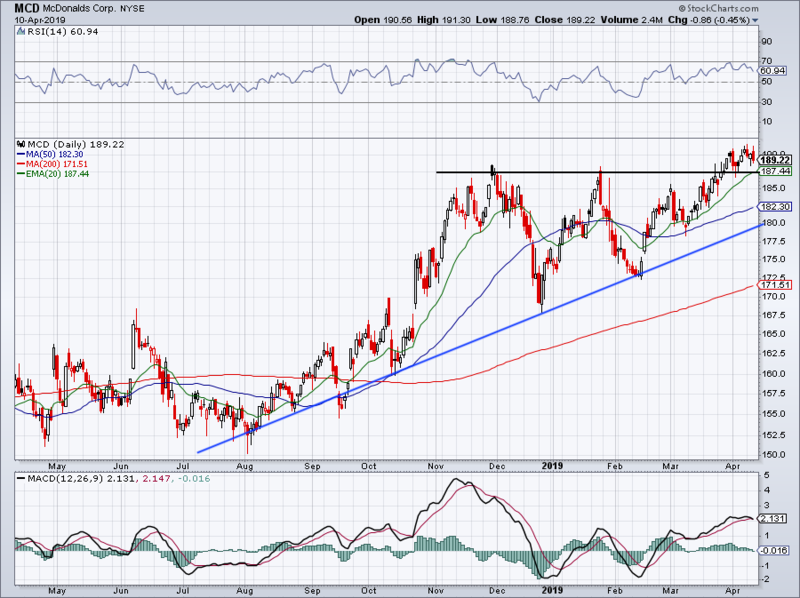 Not quite as strong as the Chipotle rally, but one clearly with caffeine fueling its run is Starbucks (NASDAQ:SBUX). 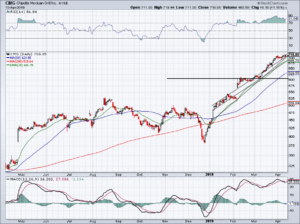 Earlier this week, I highlighted Starbucks stock as it was knocking on $75 resistance. I said that it’s hard to get too bearish on Starbucks given its momentum, despite how much it’s rallied in the past few months and quarters. Now pushing over $75, shares are definitely overbought. But as we just saw with Chipotle, that condition can persist for quite some time. If Starbucks stock rallies into earnings on April 25th though, it will become a strong candidate for a sell-the-news event. If the U.S. business can continue to buoy Starbucks’ business until the Chinese business re-accelerates, SBUX could have plenty of upside over the long term. For now though, estimates predict 6.3% revenue growth this year and 7.8% growth next year. Earnings are forecast to grow 11.6% this year and 12.2% next year. For this, investors are paying almost 28 times this year’s earnings. The bears will quickly point out that this valuation is stretched and given the stock’s near-60% rally from the summer lows, that claim has some validity. But SBUX is a cash cow with strong margins and continued growth. That cash is being used to fuel an aggressive rollout in growth-hungry China, buy back large chunks of stock and put through huge increases in the dividend. 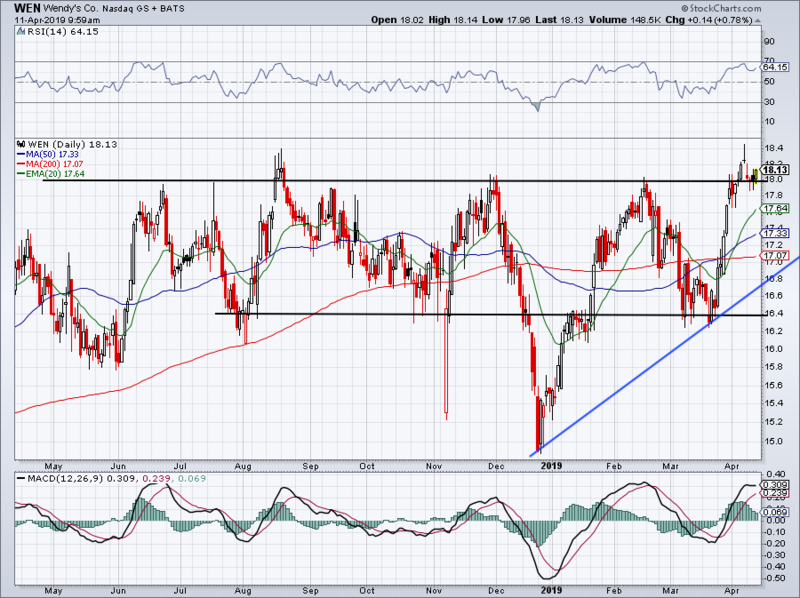 Until the trend fades, SBUX stock is a buy-on-dips name. McDonald’s (NYSE:MCD) is likely the first stock that comes to mind when talking about fast food stocks. The Golden Arches are almost never a bad choice when looking for a long-term investment. Sure it goes through lulls and at times the stock is overvalued, but at the end of the day, its products are in demand. It doesn’t matter about the trends in gluten or impossible burgers. Customers still want a Big Mac or McDouble with fries and that demand isn’t going to fade. As a result, MCD rings up billions a year in profits. Before its most recent earnings report where McDonald’s missed revenue expectations, it had beaten top- and bottom-line expectations nine quarters in a row. That “miss” though was by just $1.6 million on a consensus estimate of more than $5 billion. It shows just how incredibly consistent MCD has been over the last few years. While shares are hovering near all-time highs, the charts still look constructive and I would love a buyable pullback should this $187 to $188 area not buoy the name. The average price target hovers near $200, giving investors decent upside should it get there. Plus, McDonald’s is one of the best dividend names you can own. Aside from having a savage social media account, Wendy’s (NYSE:WEN) stock has been doing well too. 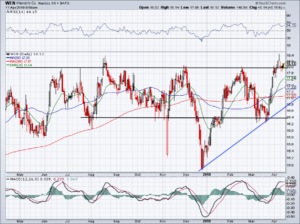 $18 had been resistance for almost a year before WEN stock finally pushed through it earlier this year. Wendy’s has come up short of revenue estimates in four of the last six quarters, but after a volatile two years, expectations are settling down a bit. Analysts expect 4.9% revenue growth this year and 4.3% growth next year. On the earnings front, estimates call for 5.1% growth this year and a whopping 22.6% growth next year. If Wendy’s stock can maintain momentum for the next few quarters, investors may really start to feast on this one in anticipation of that big earnings growth next year. 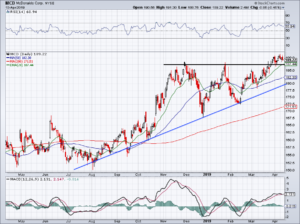 Should it lose $18 though, look for support to come into play near the 200-day moving average and uptrend support (blue line). While not quite as a high as MCD’s 2.45% dividend yield, Wendy’s 2.2% payout isn’t unattractive after a 17.6% bump in February. For years, Domino’s Pizza (NYSE:DPZ) couldn’t be stopped. The pizza maker was one of the first food companies to really embrace technology in a meaningful way. Consumers could place delivery and pickups order in a snap on the app and website. This not only gave a boost to revenue as more customers climbed aboard thanks to the convenience of online ordering, but it also gave a lift to margins. Domino’s had less mistakes on its orders and therefore wasted less product. While the stock was a steady beast for many years, that hasn’t been the same story over the past year. 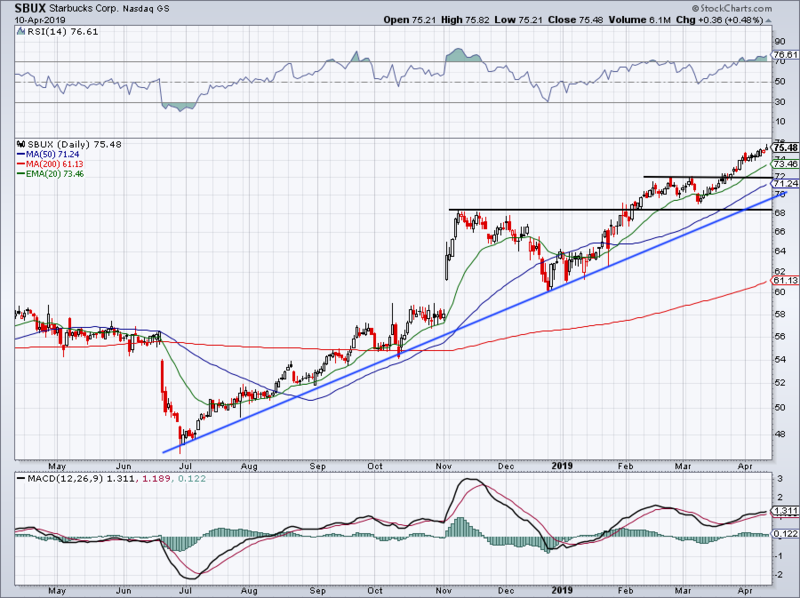 The stock is roughly flat over the past 12 months, but that may lead to big gains if DPZ can regain its prior momentum. On the weekly chart, you can see that these multi-month bull flags are not uncommon for DPZ. 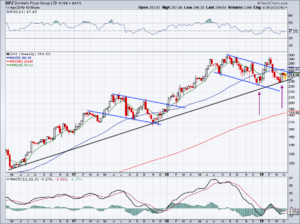 A break out of this pattern and a close over the 50-week moving average could ignite the stock to $300 and above. Analysts expect 9.7% revenue growth this year and next year, and earnings growth of 11.3% this year and 17.2% next year. If DPZ can deliver on these expectations (and perhaps more), maybe that will be enough to get the stock moving higher. Others say the stock’s too cheap, so take your pick. Bret Kenwell is the manager and author of Future Blue Chips and is on Twitter @BretKenwell. As of this writing, Bret Kenwell is long SBUX. Article printed from InvestorPlace Media, https://investorplace.com/2019/04/5-fast-food-stocks-that-are-on-fire-mcd-sbux-cmg-dpz-wen/.